Daily Deals (sites like Groupon, LivingSocial, and local equivalents) are a popular offering from float tank centers, and consumers tend to gobble them up. When a float center runs a Groupon or other daily deal we are able to profit immediately and do not feel a strain on our resources when customers redeem them. After all, it costs nearly the same amount to maintain an empty float room as it does when someone floats with us. That’s all well and good but the overall aim of Groupon is to gain customers, right? How well does Groupon work for client retention? How can we create a higher retention rate? Measuring the overall effectiveness of Groupons is a difficult task. The Float Shoppe has had a very positive response rate from customers. According to Groupon’s own feedback tracking, 97% of customers would recommend us to a friend. 99% of Living Social customers had a postive experience, with 95% of customers saying they would return. Yet, despite the positive feedback we have found that overall most customers do not come back. If so many daily deal customers enjoy the service, why aren’t they all coming back? Something I’ve learned from others in the wellness industry is that people are terrible at self-care. This holds true with float tanks as well. No matter how much a person enjoys their float, they are very unlikely to book again once they leave the building. If they do, it can be a very long time before they come back. 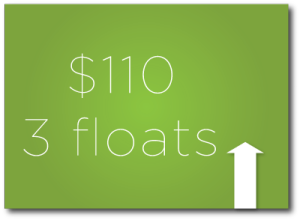 Since opening, we have attempted to bridge the gap between someone’s first float and potential subsequent floats by offering a ‘three 90-minute floats for the price of two’ starter package ($120) and it has worked very well for us. During our first Groupon run we decided to offer customers a $10 discount on this starter package as a thank you for supporting us. This immediately increased our sales, however we were curious if we could get an even higher purchase rate on our discount package. We came to the conclusion that three floats were a lot for someone to buy on someone’s first visit for a customer coming in with a coupon. The general adage with floating is that the 2nd and 3rd floats are when it really clicks, so forcing a fourth float on someone didn’t make sense. 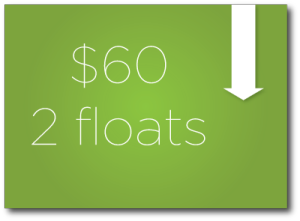 We decided instead to offer two more floats for the price of one ($60). Strangely, our connect through rate dropped drastically. Despite offering a better deal, customers were far less likely to buy 2 floats at $30 each than 3 floats at about $37 each *. We also didn’t feel great about discounting our floats so drastically because a) of how much we value our floats and b) we wanted clients who arrived at a discount to become accustomed to paying more than their initial price as opposed to stagnating at the very low Groupon price of 50% off. Again we decided to change our prices. This time around we kept the amount of floats offered in the package small, creating a price point that was a good deal for the customer and one that felt good for us. 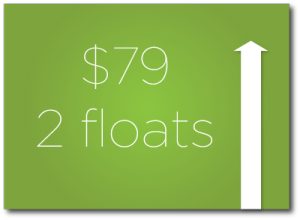 We came up with the price of $79, about the same amount of money we made per float from our regularly priced starter package. This made our purchase rates increase dramatically over all other Groupon customer packages. The only problem with our new package was letting people know about it. When should you tell someone? Before their float? Afterward while they are in their bliss state? We found it difficult to find a perfect time for each customer. My partner Sandra and I found that we are not interested in upselling our customers and are far more interested in their experience in our shoppe. We were often fairly awkward about letting our clients know about this special pricing, and often times would never bring it up. 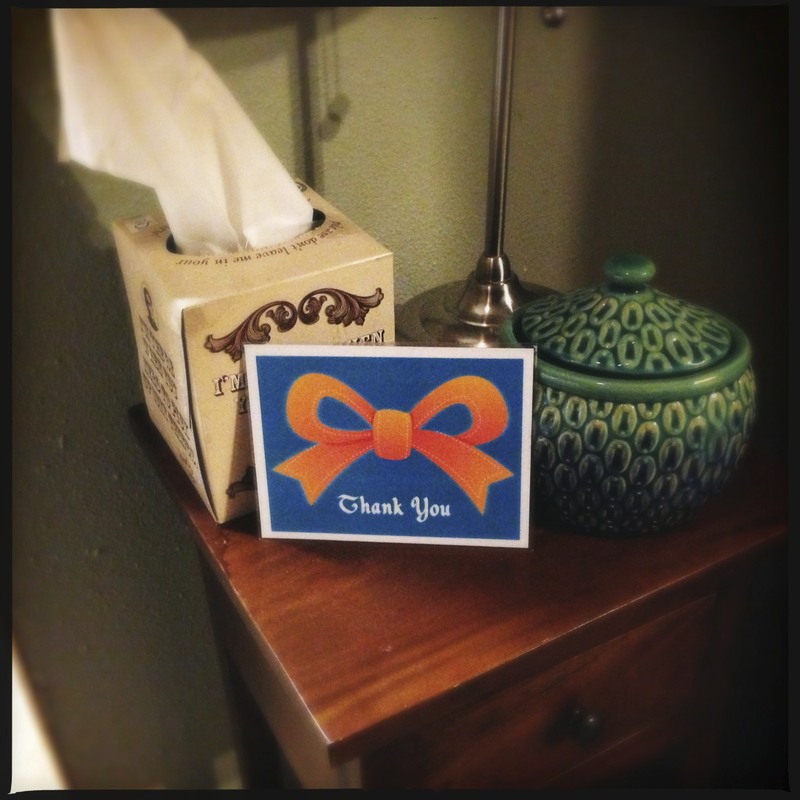 In the end we came up with the idea of leaving laminated cards in the float rooms that simply said ‘Thank You’ on one side, and described the special on the other. We now mention the option for discounted floats and point out the card when we show our new customer their float room, describing it as a ‘thank you’ for supporting us with the Groupon. We started keeping track of the connect through rates with our ‘Thank You’ cards about a month into our last Groupon run. Initially we had about a 40% connect through rate (I believe this number would have been higher had we started tracking earlier). As the Groupon sale met it’s expiration, the rate eventually fell to about 32%. This was when it all seemed to come together. The benefits are that as non sales-oriented people we don’t feel pressured to tell customers about a deal when it might not be the right time; our customers are always informed of discounted pricing and are pleased to know of the deal; and there is absolutely no pressure to purchase if they aren’t interested. In the end we found that small packages at a modest discount (and with the number 9 at the end of the price) had the right feel for both ourselves as business owners and for our customers. We have also become more comfortable talking to customers about our pricing as we have realized we are informing them of something they are excited to have. Note: While daily deals can be a great marketing tool and even used for profit, there are risks involved, research that will need to be done and considerations that are necessary for a positive experience for your business and customers. I will cover these topics in a future post. * For more information on why humans make these kinds of choices, I recommend checking out the book Predictably Irrational. Kane, thank you for the information! That one is completely new to me and definitely worth considering. There is a lot to consider when running a Groupon and you definitely need to do your research and make sure you are taking care of your business in more than just a short term financial grab. I know that Groupon agreements are different all over the world and am curious if this is now a universal tactic. This is something Groupon did with me without letting me know beforehand. They told me that I could have them take the ad off at anytime if I asked. So interesting. I wonder if the 9 influence is true primarily for specials, or does it hold true for regular pricing? Are these studies saying that our 4 float per month membership may sell better if it is $139 instead of $140? It’s so strange that people are more willing to buy when the price is higher. Thanks for sharing your findings! The laminated card idea is great, too. Dylan, I really appreciate you and your site for all of the candid and insightful information you provide. I’m interested in opening my city’s first float center and I’m picking up plenty of knowledge and inspiration here. Thanks Amir! Good luck to you! !